A new night is starting at Retro Bar on Thursday. Leaning towards the more alternative side of independent music, All My Heroes Are Weirdos, which will take place on the third Thursday of every month, takes its inspiration from bedroom discos and looks set to fill the vacuum left by much missed nights like Dot Dash/ I Could Care Less and previous Retro Bar nights like Killing Fantasy and Fight Club. The organisers aim to counter what they see as the 'apathy' of Manchester's clubbing scene, and the night will complement the good work of existing discos like Panda Panda (currently sharing a night with Underachievers Please Try Harder at Saki in Rusholme), Underachievers Please Try Harder and Asparagus Next Left (Star and Garter). All My Heroes Are Weirdos is the brainchild of four disillusioned Manchester clubbers, including Phill Daker who puts gigs on under the name Mushaboom Folk. He's joined by Emma Tillyer, Sean McGurdy and Heather Hewitt. How are you going to be different to any other indie disco? We’re all quite bored with the current crop of indie nights going on in Manchester. Most of them seem too concerned with playing what’s ‘fashionable’ … so we decided to start our own night and see how people respond. There are four of us involved in the night, each with our own music tastes, so hopefully we’ll strike a chord with other frustrated clubbers. Do you think indie discos are generally too 'apathetic'/ 'vacuous', as you say on the All My Heroes Are Weidos facebook page? I guess we were sick of spending our money on nights that only play new new music, where people go to them to pose and pretend to know all the words to the latest remix of the latest electro band. So yes … We do. Is there enough diversity in Manchester clubnights? A little, but not enough. Great clubnights will always exist here. We just want to be part of it…and not sit at home complaining. The DIY ethic is something we all believe in. You describe a disaffection with 'fashionable clubs' on the facebook page - are you anti-fashion? We’re definitely anti fashion within music. We’re not influenced by charts or who’s in the NME cool list, we’re just going to play the records we listen to in our own bedrooms. Why should people venture out on a Thursday night rather then stay at home? Thursdays are the new Fridays! And Retro Bar is a great venue, supporting Manchester music rather than harming it with high entrance prices… Plus it has drinks offers every night of the week! You promise mixtapes at the launch - will they be monthly? Will people be encouraged to take their own and swap them? The mixtapes are just for the launch at the moment, but if they get a good reception we may consider making them a feature of the night. Will there really be cake and biscuits too? Homemade? How did you come up with the idea of an anti-heroes disco? We’re all fans of outsider music - oddballs, weirdos, geeks, punks, romantics. These are the people we love! Will you be playing more obscure tracks by bands than might normally be heard at a club - ie. not necessarily the hits? We can’t deny that the ‘hits’ will get people up and dancing, and singing along with each other, so we’re not going to be all snobby and not play them - we want people to have fun! But we will be playing obscure tracks, and playing songs by bands you may not have heard of before, because we’re all proud geeks. The music you're going to play is a lot different to the music you put on with Mushaboom - are you trying to deliberately do something that’s the opposite to your usual folkiness? / Are you hoping to attract the same crowd as at your Mushaboom gigs? Mushaboom is just me, whereas three other people are doing All My Heroes, each with their own input and music tastes. That’s why our night will stand out from the crowd. Is your target market disaffected youth - people who might normally be a bit shy at a disco? Not really thinking market wise: we are friends who are trying to make a night we would all enjoy and hope other people will too. Although we do want people of all dispositions to feel comfortable at our night and not feel like they can’t come and ask us to play a song! You mention ‘secondhand records’ in the blurb to the night-are you going to be playing vinyl? There maybe vinyl, CDs, laptops we are taking a DIY approach to the night, learning as we go along not promising the tightest DJ set, just the music we love. Why did you decide to name your night after the !!! [genre defying California party band] song? Without looking too deep into it, we all came up with some ideas and agreed on 'All my Heroes'. The name just seemed to represent what we wanted our night to be about. Its a great tune too! All My Heroes are Weirdos launches at Retro Bar, Sackville Street, on Thursday April 30 at 9pm, with drinks offers and cheap doubles all night. On Wednesday, I went to an open meeting at the Chapel, the newish arts and social space in the old photographic society building in Platt Fields Park, about an exciting new writing project. Run by Alice White, An Apathetical Reader - which is affiliated with the Chapel Community project - will be an online newspaper dedicated to giving a voice to those in Manchester who feel like they wouldn't normally be heard, or feel isolated from the communities around them. White describes An Apathetical Reader as "a forum for Manchester's displaced, disheartened and disillusioned individuals that aims to question the meaning of apathy and the effect it has on those around us. By creating a space for all artists, be it photographers, illustration artists, journalists, writers, poets, musicians, lyric penners, painters, activists, with no specific political charge and no limits on who can enter into the dreamworld of An Apathetical Reader, individuals can be encouraged to realise and release their potential." She says: "We hope to connect people to create a positive consensus, spread the word of hard work and provide an intelligent zine that encourages every kind of expression." The site will meld local and national political commentary with features, profiles of inspiring people in the area and arts pieces such as music writing - White, who has a background in music journalism, wants it to be a place for people to go and find music they've never heard about before. It will also be a forum for people to display their previously unseen work. White says: "It's all about encouragement." The site will show the work of local artists, and also be a place for them to discuss their influences and inspirations, with links to other pages. Networking will be key to the site, which White describes as a "building process". An Apathetical Reader is supported by People's Voice Media, an organisation which aims to bring communities closer and encourage independent reporting by members of the community for members of the community. Like fanzines, the site will be a 'mish mash' of different ideas and themes, but will aim to provide news of what is happening in Manchester. Inspirations range from music magazine The Stool Pigeon and American counter culture journal Arthur to The Mule, with its mix of analysis and cultural features. White says: "You can get a news story from anywhere, from council meetings to MPs' surgeries. Try and be probing, anything could come of it." * Music journalism with real content. To get involved, contact Alice.R.Apathetical@gmail.com or attend one of the meetings at the Chapel to meet likeminded people. One of the most striking sights on Liverpool's skyline is the shell of St Luke's Church at the top of Bold Street, where Berry Street and Leece Street meet. 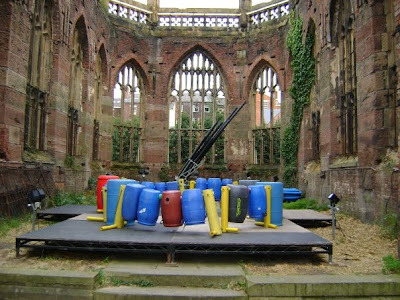 It's also one of Liverpool's most interesting art spaces, hosting the group Urban Strawberry Lunch and holding open air film screenings (including a 1939 version of The Hunchback of Notre Dame), theatre and gigs. 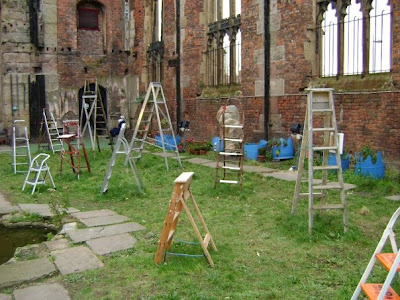 I first visited during the Liverpool Biennial, when Yoko Ono transformed St Luke's into a growing forest of stepladders, donated by the public as part of her installation Skyladders (when I mentioned this to the woman on the door last week, she said "Don't talk to me about stepladders!") . These added to its derelict building site feel. 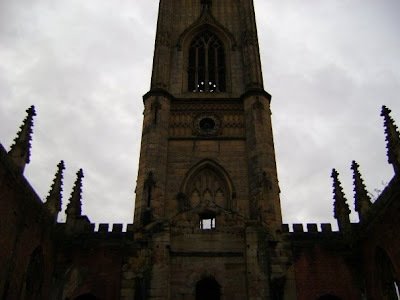 St Luke's is a well known local landmark, referred to as the 'bombed out church' or, on Urban Strawberry Lunch's website, rather sweetly, as Bombdie. The church was bombed in 1941, leaving only the clock tower in tact, with its heavy wooden door. It's still imposing and ornate, even with Liverpool's solid Anglican Cathedral looming in the background. Peer into the corners of its windows and you can still make out stained glass figures, tiny lights adding unexpected colours to the church's bleak frame, muted brickwork and blackened beams. Defiant stone faces still stare sternly from its walls. Weeds grow round its Gothic window frames like something from a fairytale, the church's solemnity muffled by a carpet of grass. It's open to the elements, but also to the residents of the city as a community space. 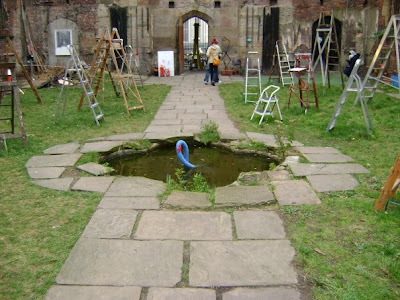 Just behind the main shopping hub, and the dereliction of Duke Street, it's a quiet refuge from which to look out over the city, a walled garden in the middle of a metropolis, a water feature in the centre, like an enclosed park with its own pond. It's a place of reflection, housing a memorial to the victims of the Irish Famine. On the pleasant Friday afternoon I spent wandering around Liverpool in the sunshine last week, St Luke's was inviting people to take part in Urban Gardening, which takes place every Friday. Inside, last year's bulbs are now blazing with colour, something growing alive out of the ruins. The church is also delicately decorated with red wool, hanging from twigs and wrapped around doors and stonework. The lady in charge said this was the work of the Chinese community during Chinese New Year celebrations - Chinatown is just across the road, and St Luke's aims to be a space for local communities. She rolled up her coat sleeve and showed me red wool tied around her wrist like a fragile friendship bracelet, saying they decorated her too and she couldn't take it off as it signifies good luck. St Luke's definitely needs some good luck - I was also told that, although it's Grade II listed, the group pay re nt to the council, who want to knock it down to build flats. Like so many things, it's difficult to secure funding. So, if you're ever in Liverpool, visit, donate, to keep St Luke's open. If you could sum up Manchester in a single image, what would it be? And is it possible? An exhibition at CUBE sets out to capture the spirit of Manchester, comprising of hundreds of images - mainly photos - sent in by the public. The postcard size images offer snapshots of Manchester life, from its landmarks to small, neglected corners and alleys most of us walk straight past on a daily basis, with ten winning entries receiving £500 for their shots. There's no single image that, taken in isolation, says Manchester and sums up its essence, but taken as a whole the images give a sense of the chaotic fragments that make up life in the city. I wasn’t impressed by the judges' choices of winners which, apart from a shot of graffiti boasting 'Gorton girls know all the words to songs by Chaka Chan', seemed a bit predictable. Winning images will be printed as postcards (click here to read Phil Griffin's excellent article about the lack of variety of Manchester postcards). As you’d expect, Castlefield is well represented in the submissions, including the often seen shot of its two towers - an old, redbrick one rising from the shadow of the Beetham tower that dominates the city skyline. The famous curves of Central Library are returned to over and over again, and it’s good to see B of the Bang commemorated before it goes forever. Many photos take the architecture of the city as their starting point, often focusing in on quirks like gargoyles. Old and new is a recurring theme, and one of the most effective shots places ornate redbrick turrets against the protruding glass blocks of the new civil justice centre in Spinningfields, a bizarre and extreme juxtaposition. The derelict Department of Employment building, its former purpose just about identifiable from battered letters on the front, takes on a new relevance for our times. Victoria Station deservedly gets a look in, with its map of railway routes, and the destination signs outside, where a tiny Hull is squeezed in between Newcastle and Belgium. There is a large number of photos of triumphant symbols of the new Manchester like Urbis and the big wheel, many of which are embellished with technical trickery and special effects. The ones which are unplayed with are more effective, though, showing Manchester in its natural state, from the utilitarian street namies of Ancoats - Mangle Street - to a row of boarded up terraces. Pictures close in on doorways and abandoned entrances or the front of an Asian grocer's and an MEN newsagents. A worthy winner would have been the photo taken from the top deck of a Magic Bus, a rival Finglands in the background - what could be more typical of the Manchester experience than a journey along the Wilsmlow Road corridor at peak time? My favourite photos are the ones that look beyond the glossy image - all shiny glass and big gestures - that's sold to tourists and could be seen in any of the council's promotional literature. The photos are best when they just show what's there already, and make us look at it closer, rather than trying to impress by montaging or photoshopping. For example, the area outside the Thirsty Scholar and the Attic with its spiral staircase is given a new, fairytale magic when framed in black and white that would be missed by the casual observer. Among my favourites are those which look past Manchester's monuments and architecture, forego grand aerial views to get down to the level of its inhabitants - one photo even crouches down to a goose's eye level. It's Manchester's inhabitants that make the city what it is, after all. A portrait of a teenager wearing a tshirt asking ‘Do I f***ing look like I’m a people person’ is instantly recognisable to anyone who spends anytime in Cathedral Gardens at the weekend, where teenagers congregate. Canals and woodland are more interesting when they have people silhouetted against them, Piccadilly Gardens more alive when children play in its fountains. The shiny new city of Spinningfields is made more human by a woman waiting by a 'Meet me in Spinningfields' poster -the advertising message becomes literal rather than an empty slogan of redevelopment. The best photos are those dictated by circumstance, such as sunshine catching on street sculptures in New Islington, a springboard for a burst of sunlight to leap out against a cloudy sky. One of my favourite photos shows the outline of a couple holding hands in the snow, next to the Temple in Heaton Park. Incidentally, I'm far too disorganised for submitting anything to any exhibitions. I think this is my favourite Manchester photo, of Plymouth Grove pub in Ardwick, taken well over a year ago. 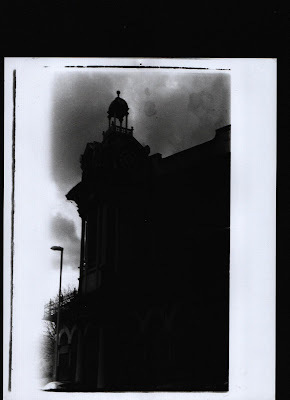 It was the first photo I developed by myself, and wasn't meant to come out so dark, but I thought the darkness suited it perfectly, making its distinctive clock tower (Grade 2 listed) stand out against a moody Mancunian sky. The pub's derelict and boarded up, in an area that's had huge building programmes going on all around it. I don't know if it's still there, but I hope so. 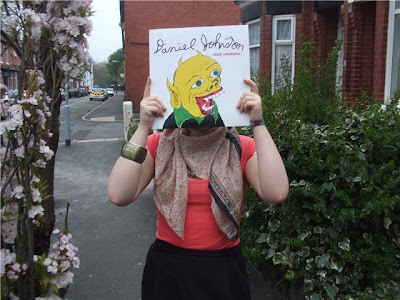 A few months ago, I rediscovered one of my all time favourite records. It's one of those perfectly composed examples of the three and a half minute artform that seemed to say everything about my life at the time when I first heard it, and can be returned to over and over again, and still sound exactly the same however my life has changed since I last listened. I first came across I'm Hardly Ever Wrong by Irish band the Would Be's when I recorded it by chance from Steve Lamacq's Evening Session. Growing up in a small town, his daily show on Radio 1 was my only entertainment for a couple of years, and it introduced me to many classic songs, as well as new bands. I still have the cassette, which is marked Jan-March 2002. I'm Hardly Ever Wrong, a lost indie classic from 1990, takes up even less than the conventional three minutes, nestled in between Hole and a live session by Easyworld. Presumably, my finger, hovered over my stereo, hit the record button soon after the song started, drawn in by the distinctive opening notes of the intro, which trundle into a piece of perfect pop that is as unique as it is timeless. The female singer's slightly husky voice is unforgettable, gliding through lyrics about how seeing a film, reading a book, hearing a song, "changes your life, but only for a day, and a day is not enough". She's almost blase, prematurely worldweary like someone who's been through it all before, the chorus soaring to its conclusion that "i'm hardly ever wrong" with the self-assuredness and world-conquering ambition that's unique to teenagers - or at least, I saw in my 14 year old self. 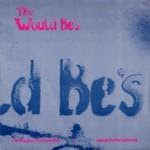 Despite its superfluous apostrophe, in my mind The Would Be's is also up there with all time great band names, memorable because of the aura of mystery it creates - 'would be' suggests unattainable dreams, unfulfilled ambition, something elusive and hard to come by, not yet accomplished. I tried to find out more about the band on the internet, but to no avail - until a few months ago, when I discovered they had finally created a myspace, where two more superb songs can be heard. Unfortunately, it seems the Would Be's were to become Would Have Beens, and disappeared without ever even releasing an album. I'm Hardly Ever Wrong is one of those songs I wish I could have written, and something my own music aspires towards. I contacted the band with a list of questions, as much to satisfy my curiosity as anything else. I'm fully intending to write their responses up as a proper interview for a fanzine soon, but until then, and to coincide with the 19th anniversary of the release of the song, here are there answers in full, which are brilliant even in their unedited form and discuss subjects close to my heart like the radio, John Peel, teenage spirit, grand dreams and ambitions and even just the experience of being a young band in the music industry. The Would Be's consisted of three Finnegan brothers, Matthew, Eamonn and Paul, assorted guitars. Julie McDonnel singer. Pascal Smith drums. Aideen O'Reilly trombone and saxophone. Eileen Gogan singer who replaced Julie. How did you meet and get together? Guitarist Matt was asked to play in a local variety show in which Aideen was involved, Aideen was a friend of singer Julie, so due to a shared interest in good music the Would Be's were born....and of course a secret shared interest in being rich and famous but we didn't talk about that !!! How did you come up with the name the Would Be’s? We wanted a name that would suit our down-to-earth unpretentious modest attitude to music and life, plus we had the mistaken belief that we just couldn't be a great band without being part of some elite group of people who were somehow ‘born to greatness' . I did say that we were modest, it's the one thing that we could boast about at that time !! so after some searching in ' Virtues English dictionary' ( Encyclopaedic Edition ) we found '' Would be '' and we liked the sound of it and how it looked in print. How old were you when you released I’m Hardly Ever Wrong? A mental age of about nine or ten but the band had a physical age of between thirteen and nineteen ish and it's a fact that our thirteen year old rhythm guitarist Paul didn't get to play a certain gig in Dublin because the owner of the venue wouldn't let him in cause he was underage. but hey....that's rock'n'roll...man ! It sounds quite teenage - what did you write songs about? We were influenced by a wide range of music, famous bands like the Smiths and the Pixies, no so famous band like, Half man Half Biscuit, Bongwater, Freiwillige selbst-kontrolle ( F.S.K. ). I.Ludicrous, Shonen Knife, the Frank Chickens, the Pooh Sticks, Jonathan Richman, Flying Lizards, John Cooper Clarke, and lots more. How did you come up with the idea of having brass in the band? Well one day I was walking past the local scrapmetal yard and I saw a big brass bed.......( only jokin ). The trombone and saxophone came about because Aideen was a member of the local brass and reed band, we thought that it added a nice touch to the guitar based pop music that we were playing and as we got more well known we found that people really liked the fact that we sounded different to the other rock and pop bands around at that time. '' Ya cant bet a bit of brass '' as they say...........in brass bands, I suppose ! How did you write one of the catchiest indie songs ever and then just completely disappear? Well it wasn't easy, it takes a special kinda talent to disappear so quickly after breaking through in a very competitive business, when the single '' I'm hardly ever wrong '' came out, some of the biggest record companies in the world wanted to sign us, the phone was hopping all day every day after the late very great ' JOHN PEEL ' played the song on his bbc radio 1 show, we had A & R people coming from New York and London to hear us playing live in some small out-of-the-way towns in Ireland, sometimes they got lost on the way to the gigs and were never seen or heard of again !!!!!!!!!! maybe....! but in the end we signed to a small independent record company in London because we wanted complete artistic control, we thought that the big companies would tell us what to do, well the small company didn't tell us what to do....... but they also didn't have the money to make the record a hit, so it was a combination of ' naivete, idealism, big headedness and downright stupidity that helped us to disappear from the scene. but we're not bitter......................oh yes we are !.......but only a little......when it's very cold and we haven't much to eat..! Why is there no information about you on the internet? We didn't plan it that way but we kinda like the fact that there's not too much information on the internet about us, it adds a bit of mystery in these days of instant knowledge, instant gratification and instant coffee.....it's nice to be anonymous but then again that works against you if you're trying to sell music.............can we have it both ways ? ?...........no, didn't think so ! Did you never record an album/ why? We didn't get to record an album, we got a bit distracted at the time and our first singer Julie McDonnel decided to stay at school, we were looking for a new singer for a few months, which is a long time in the music biz, when Eileen Gogan joined the band we recorded four songs with producer '' STEPHEN STREET ' those four songs plus four songs we had recorded with Julie McDonnel have just become availible on itunes as an E.P. '' 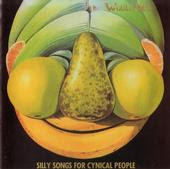 SILLY SONGS FOR CYNICAL PEOPLE '' the song '' I'M HARDLY EVER WRONG '' is included on it. so that's the nearest thing to an album that we have released. Did you ever meet John Peel or go on his radio show? Sadly we didn't get to meet john peel but he did phone us a few times, I think that he was a bit concerned that we might get eaten up by some of the big sharks in the music biz ,and ya know I think he was right, we kinda did !! . John gave us his home phone number which was an honour to have but wouldn't you know it one of the times that we rang him he was in the middle of his sunday dinner, he talked to us anyway and didn't seem to mind, he was a very rare and genuine person in a business that is known to be full of common and false people, we were very saddened to hear of his death, I'm sure he would still be doing his show on radio if he had lived, we didn't get to go on his show live but we did record a four song peel session for his bbc radio 1 show in Maida vale studios London, he broadcast it a few times which was a great experience, we had been big fans of his show for years before he played us, it was a dream come true, so that proves that dreams really do come true...............well, some times.......................if you dream hard enough! What did he like so much about your song? The first time that he played it he said he liked the sound of the guitars on the intro and he played the intro part a few times to point that out, he also played the b side that first night and he said that '' I'm hardly ever wrong '' was a wonderful classic pop song and that he hoped that bbc radio 1 would put it on the daytime playist but alas for some strange reason they didn't , maybe because it was a wonderful classic pop song and you cant have that kinda thing on daytime radio now can ya ! You beat Morrissey, the Charlatans and Nick Cave to reach number 12 in John Peel’s 1990 festive 50 - that’s quite an honour! How did you feel about that? We were very flattered by that as we are big fans of some of the bands we beat, it was a good confidence booster at the time, but maybe it's not a good thing to get too confident when you're young and foolish, there's nothing bigger than a big head. You have a song called My Radio Sounds Different in the Dark - are/ were you a big fan of the radio? We have always enjoyed listening to the radio, used to listen to it in bed, in the dark for an hour or two before going asleep, that's where the inspiration for that song came from, music is much more vivid in the dark, much more intense.....man ! and as it happens, I'm listening to the radio at the moment as I write out this interview and you may not believe this but D J Chris Hawkins on BBC 6MUSIC has just said he will be broadcasting the Would Be's John Peel Session on his show, friday 20th.march 2009. now that is what I call a coincidence ! and it does sound different, in the digital audio dark . !!!! Did you play much in the UK? I think we did two short tours of the UK . which was very exciting for us at the time, we played in Liverpool, a venue called Planet X , Morrissey was suppose to come along to hear us play at that one but the manager said he always gets mobbed everytime he goes there so I dont think he showed up that night, I think the support band was called '' Barbel ''. We also played in ''the Mean Fiddler '' '' the L.S.E. '' '' the Boarderline '' and the '' Venue '' new cross London where the support was from a band called the ''Boilweevils '' .We got to stay in that famous rock 'n' roll hotel near Hyde park '' THE COLUMBIA HOTEL ''where all the rock and pop bands used to stay and maybe still do ! New Kids on The Block '' were staying there at the same time as us, ahh well, bad timing there !! but the Inspiral Carpets and Lush and the Greatful Dead were there aswell so it wasn't too bad, a big name D J from Los Angeles '' Rodney Binginhimer '' a d j on KROQ radio came to hear us play in the L.S.E. ( london school of economics ) he took some photos of us and had a chat backstage, very rock'n'roll, He was one of the first d js to play Blondie and the Ramones, he's known as the Mayor of Sunset Strip ' these days. Oh, and a big fan of ours from England, a one '' William Shakespeare '' came up to say hello to us after that gig, now you wouldn't forget a fan with a name like that, wouldest thou !! so hello to William if he happens to see this. We really enjoyed the UK gigs a lot . Were there any other bands that were doing the same kind of thing as you at the same time? Not too many that sounded the same with brass instruments and a female singer and of course ' wonderful classic pop songs '. We're still modest !!! Did I’m Hardly Ever Wrong enter the charts? The single didn't get playlisted on bbc daytime radio at the time we released it and we were on a small indie record label so we didn't get through to a big commercial audience but it did reach number 5 or 6 in the independent charts, which was nice. Well, why indeed ! maybe we'' just haven't earned it yet baby '' ( as the Smiths once sang ) I think part of the reason is because we didn't make the right decisions at the right time, we got lost in the moment, and what a moment !! but as some wise man once said,( '' if everybody was somebody, then nobody would be anybody '' ). Hope he was right about that ? Do you feel like your songs should be better known and should be being played at indie discos? We would like it if people got the chance to hear our songs at indie discos so that they could decide whether or not the songs deserve to be better known, I suppose every band thinks their songs should be better known but ultimately the people shall decide. How long were you together for and why did you stop making music? I think we were together for just about two years or so, it was a kind of whirlwind romance with the music biz, not sure why we stopped but as the initial buzz died down I think we lost interest, it must have been a case of '' too much too soon ''. Most of us are still involved in music, Pascal Smith is giving drumming lessons, Julie is an art teacher, Aideen is working in art and fashion, Eilleen is writing and singing songs under the name '' Melba '' us Finnegan brothers are still writing songs and playing music. I think the last gig we played was in 1991, could have been a venue in Limerick city. Are you going to make any music together soon? No plans to make music as the Would Be's at the moment but the Finnegan brothers are writing some new songs with a female singer and may release them under a different name sometime if they sound any good.........which of course they will !!!!!!! If you play any gigs soon, will you play some of your old songs? Would that be weird, playing them so long after they were written? If we ever did play together again we would play the old songs, I dont think it would feel weird, it would be much more fun I'd say because we wouldn't be taking ourselves so seriously as we used to. Are there any bands you like nowadays? There are lots of bands that we like at the moment, the Gossip, the Arctic Monkeys, the Yeah Yeah Yeahs, Richard Hawley, the White Strips, the Kills and many many more, as they say ! It’s that time of year again. The days are getting longer, flowers are blooming, the sun is coming out more often - and one of Manchester’s best loved buildings is having a spring clean and reopening to the public. Victoria Baths’ popular open days, held on the first Sunday of every month, will recommence on April 5, after the building (still in a derelict state and without heating) was closed for the long, cold winter. There’s more to do than just look around a building - the opening will be marked with a choir performance, and other first Sundays will see table top sales, a Lego workshop and more musical entertainment and performances, as well as the usual café and souvenir stalls. Even without that entertainment, though, and in its still dilapidated state, a visit to the Baths is a breathtaking experience. In September 2003, 282,018 people voted it the winner of BBC2’s Restoration programme, winning it £3.5million (including £3million from the heritage lottery fund). It was granted a further £450,000 by English Heritage, which has helped to start returning it to its former glory. Restoration phase 1 was completed in 2008, and work should start this summer on making the Gala pool fit for use again, as well as restoring the Turkish Baths. However, it will cost £20million to fully restore the building, and you can see why when you’re lost inside its grand scale and overwhelmed by its pomp and circumstance - the Baths is from a different age, when public buildings were built with ambition that went far beyond their functionality, and aimed to inspire the public and instill respect and awe. The Baths' future and place in the day to day life of modern Manchester is still uncertain, as it’s owned by a private developer - suggestions include conversion into mixed used space that will incorporate offices. From the outside, the Grade 2* listed building is imposing, standing like a large mint striped with multicoloured bricks and terracotta. That doesn’t prepare you for the inside, however, and the three huge prism ceilings. You can wander round the balconies and gaze down into the pools. The attention to detail is incredible, from the cast iron blue swimming cubicles with their candy stripe pink and white curtains and the ornate ironwork of the turnstiles at the front of the building to the mosaics with their fish designs and the panelled ceiling of the Turkish Baths. Light smears the glazed Pilkington tiles that decorate the first class males entrance hall from floor to ceiling like petrol making rainbow colours in puddles of water. The jewel in Victoria Baths' crown, though, is undoubtedly the stained glass that adorns the building, culminating in the gorgeous Art Deco style Angel of Purity in the Turkish Baths Rest Room. When the building floods with light on a sunny day, the windows cast patterns on the ceiling, walls and floors and it feels like you’re walking into a stained glass window. Victoria Baths was designed by Manchester’s first city architect, Henry Price, and built between 1903 and 1906, at huge expense. Opened in 1906, Manchester’s Lord Mayor, called it “a water palace of which every citizen of Manchester is proud”. There are sister baths in Withington and Harpurhey (which is similarly derelict, and finally closed to the public in 2001), also designed by Price, but Victoria Baths is undeniably the grandest and most spectacular. Unfortunately, the council did not share the public’s enthusiasm for Victoria Baths, which was becoming more and more expensive to maintain and repair, and the building closed in 1993, despite public opposition and being occupied by protestors. The building almost has a personality of its own, and looks like a film star (which it is). The Baths has featured in various films and TV series over the years including Prime Suspect, Life on Mars, the Barry Gibb film Now Voyager and, most recently, the execrable programme How to Look Good Naked, in which Gok Wan and Mylenne Klass encouraged women to strip naked and hosed them down in the baths. Even in its emptiness - perhaps because the pools, drained of water, amplify the ghosts of its former users - the Baths seem alive; with memories, such as the sound of children’s laughter at swimming galas, with ambition, with the large personalities that came be associated Victoria Baths, including the strict swimming teachers that are reminisced about at open days over and over again. Visitors at open days are encouraged to give their memories of the Baths for the Victoria Baths archives. The dances that were held when the floors were tiled over for the winter, sound tracked by popular jazz bands, often feature, and many couples have fond memories of meeting at the baths. Others, children, pupils at local schools at the time, describe visiting the Baths in their lunch hours and spending their pocket money on Bovril and toast from the café. That’s what must be remembered about the Baths - the role it played in people’s lives. When it opened, the authorities hoped every child in Manchester would be taught to swim, and this was encouraged through the following decades with free swimming passes for children achieving swimming certificates. South Manchester Swimming Club had its home at the Baths, and who wouldn’t be inspired by the magnificence of the building? The Olympic swimmers Zilpha Grant and Dianne Ashton trained in the pool, as well as the Sunny Lowry, the first British woman to swim the channel in 1933, who remained a familiar sight at the Baths until her death at the age of 97 last year. The Baths go beyond a sporting utility though. Built at a time when much of the surrounding terraced housing didn’t have bathrooms, families had the weekly luxury of a bath in the building. Women visited the Baths to do their laundry and friendships were forged in the Turkish Baths restrooms. 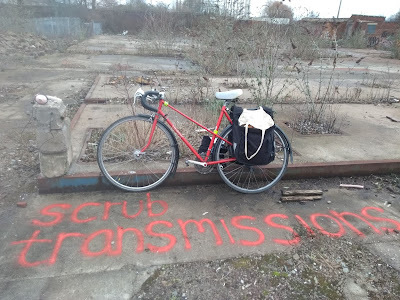 In many ways, the building is very of its time - there are separate entrances for 1st class males, 2nd class and females, and separate pools, but it’s proved adaptable over the years, even hosting Factory Records parties in the years before its closure. 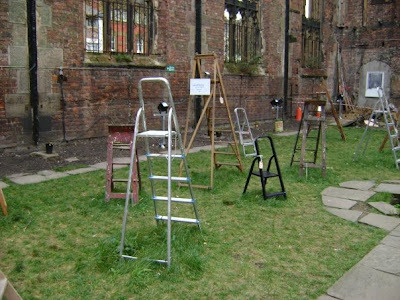 The building has been put to imaginative use as an arts venue over the last few years too, including inviting an artist in residence, Ally Wallace, to create a large scale work in response to the building last year. It’s important a financially sustainable use is found to keep Victoria Baths open to the public, not just as a tribute to beautiful architecture and design. It’s a reminder of the history of the areas around it - Victoria Park, Longsight and Levenshulme, but especially Ardwick, which in recent years has changed beyond all recognition. As well as being a concrete monument to personal history and memories, it’s a fascinating document of the way we were, the way the Victorians thought, and how far we’ve come. It’s also a tribute to the innovations in building and sanitation that found their way into the design, including Victoria Baths having its own well and water supply. The Baths also housed the first public aerotone - a kind of early Jacuzzi - in the country. Open days, starting on April 5, take place every first Sunday between 12-4pm and cost £2 for adults, free for children. Guided tours of the building will take start at 2pm every Wednesday from April 1, and cost £4. This evening, I went to the packed out preview of the new exhibition at Castlefield Gallery, which is a collection of work that was installed at various community centres throughout Manchester as part of the project 'I don't know about community networks but I know what I like' in January. The fact the work of the seven artists is now all based in one place is useful for lazy people like me who didn't get round to visiting all the venues, which were spread between Harpurhey, Gorton, Cheetham Hill and Wythenshaw. The walk to Castlefield Gallery is something I love about Manchester, partly because of the way Edward Walters' Congregational Chapel, one of my favourite buildings, comes into view little by little. Tonight was a perfect spring evening, and its tower gradually struck a silohuette against the pink sky with an unusually large pink-red sun getting lower in the background. Unfortunately, some of the exhibitions at Castlefield Gallery have gone a bit over my head in the past (although I really enjoyed the Laura White exhibition). I've found them too conceptual for the casual viewer, or been a bit overwhelmed by too much video or technicality and esoteric ideas. One and All works really well though, as there's enough of visual interest but it's also based on a sound concept - that of communities and urban regeneration, and the way we see the city around us, as well as more fundamental ideas of the changing role of the artist. There's challenging, unconventional work, such as Andrew Wilson's board game based on networks of people, but there's also painting and sculpture. I have to admit that I only got as far as the installation in the Town Hall earlier this year, called TV. Artist Hafsah Naib posted advertisements asking people who were thinking of getting rid of their television to donate it to her project, and the work TV is a collection of these TVs in a circle. We sit down and watch each of the TVs, on which are playing interviews with their former owners on the subject of television and its role in their lives - when you think about it, getting rid of a TV is saying goodbye to a large part of the fabric of your home for a lot of peope. Some the interviewees are slightly awkward, and some take naturally to the screen like actors performing a monologue. I was slightly disconcerted when I saw one of my friends unexpectedly on one of the screens the first time round, but I think that's the point - as one of the interviewees says, TV has conventionally been one of those unifying things in our society that's part of nearly everyone's life and everyone is expected to have a view on, from Coronation Street and Eastenders to the X Factor. These people aren't experts in a traditional sense - or maybe TV is something on which everyone is an expert, not least in the way in which we build up relationships with programmes and series over time (as one interviewee says, she always remembers the last ever episodes of programmes like Friends and Frasier as being particularly poignant). It's like reality TV gone a step further, challenging our notions of who should be on TV and who is worthy of our interest. For an exhibition which portrays the fast-changing world around us, it's interesting to see how the interviewees view television - often with mistrust, seeing it as propaganda, a tool for disseminating advertising and censored knowledge. It's also a reminder of how old fashioned television, a staple of our lives for so long, is becoming, in this age when children grow up with the internet as their main source of information. It starkly illustrates the generation gap: one man talks about a 'TV meter' that measured how much television the family was watching - a form of pay as you go TV, which seems extremely archaic, and another interviewee describes how a friend made the decision to get rid of her television for a couple of years in an incredulous, 'would you believe it' tone even though TV is probably going to be obsolete for the children of the near future. For some interviewees, TV is a chance to tell their life story, to have an audience for their opinions: "children these days get a better education watching the TV than they do at school". The individual's tale is also told in Jo Lewington's video Digital Film 15, Cheetham Hill August, which focuses in on the human in a uniform environment. We have a worker's eye view of a textile factory - literally, as the video was filmed by workers wearing head cameras. It's slightly disconcerting having hands appear from nowhere which aren't yours, performing the repetitive routine of a pillow manufacturer. Grennan & Sperandio offer the closest to conventional 'art', albeit starting from a marginalised viewpoint, with paintings of the type of places and details of Manchester's streets that wouldn't normally make it into a landscape painting, including that funny slither pub in Hulme. William Titley's dustbins, turned into sculptures housing water fountains and illuminated in bright colours, double as striking examples of recycling, and Jil Moore's large, transparent glass pieces, like vases patinaed with images of the city's transport system, are beautiful. Her sculptures are displayed by the gallery's huge windows, and when I was looking at them the wind suddenly shook some pale pink spring blossom from the trees outside like a snow shower. Somehow this display of nature in such an urban setting complemented Moore's vases, which project robust urban images onto objects based around translucency and light, perfectly. Unlike some of the other exhibitions of modern art I've been to lately, there's enough to draw you in for a closer look that you'll want to think about the themes behind the art - ie, the role of the individual, and how much space we really have to be individuals in the modern city. As well as giving you things to look at, the exhibition makes you think about the way we view our city and whether it's dictated by outside forces we aren't really aware of.